I've said it before, and I'll say it again: Around here, we like books. I typically have a pile checked out from the library waiting for me, while both Big Sister E and Little Sister B have shelves in their rooms piled high with books that get taken down and re-shelved daily. It is far from uncommon for me to go look for either one of them only to discover them sprawled out on their beds or the floor, engrossed in the stories that they see in the pictures. From baby board books with only pictures to large, intricate books covered with words, they both love to be a part of the magical world that books can provide. 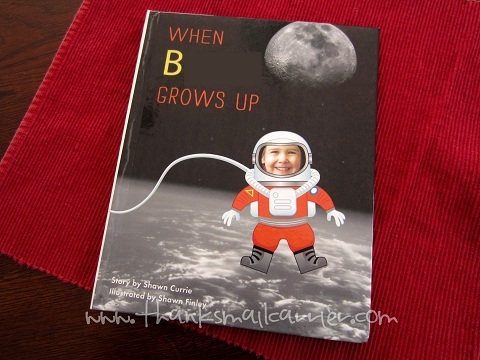 So what could make a book better for a 4-year-old that is already fascinated with them? Because providing a book that is high quality, engaging, personal, educational and extremely cool is exactly what is found at Lookio Books. Offering two illustrated character books and one photo character book, each Lookio book is printed and bound by hand with the utmost care. The result is something special that is going to stay with your child long past when that copy of Green Eggs and Ham or Captain Underpants has been discarded. Instead, your child's name and likeness appear in the illustrated character books, making the story completely personal and as if it was truly created just for them. 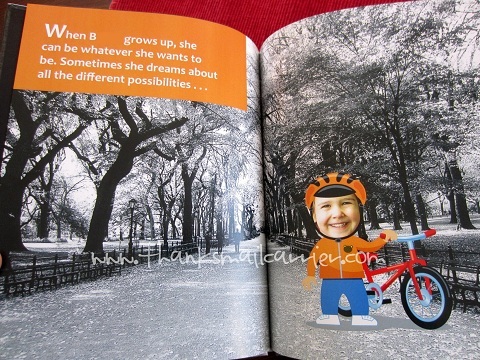 Or, as in Little Sister B's photo character book, simply upload a photo of the lucky child in your life and the skilled Lookio Books team will ensure that their smiling face is right there in every spread. Even better, Lookio makes it extremely fast and easy to create their custom books, as it only takes a few clicks, adding in an optional dedication and voilà! Instant treasured gift. I simply added in Little Sister B's name and gender (for the correct pronoun to be used), uploaded a recent photograph of her and did a little cropping and zooming, and there she was. Lookio allows you to preview each of the pages, alleviating any worries that your picture is out of place or that you won't be completely and utterly satisfied with the end result. 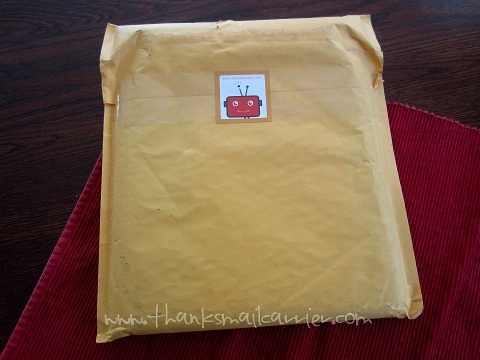 I couldn't believe that I had completed all of the steps in just a few minutes and that all that was left to do was await a package that would thrill my little girl. 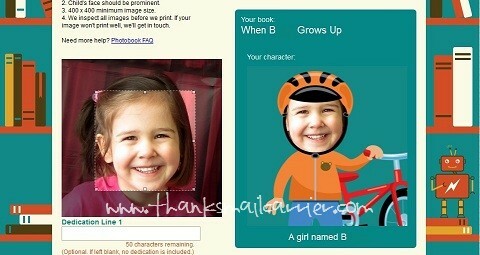 As I knew it would, Little Sister B's face lit up when she we pulled her When (Name) Grows Up book out of the envelope. For a moment or two, she looked at her picture and then, tentatively, she reached out and touched it. Who's that in the book? I asked. She turned and looked at me with a huge grin. ME!! 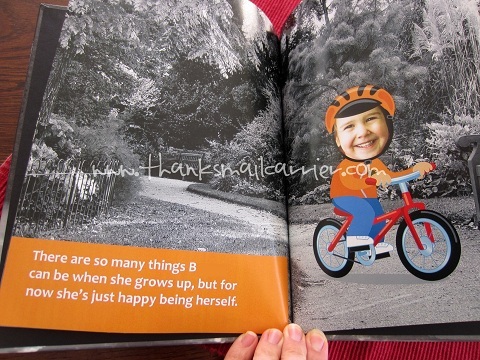 Without fail, every page of this book brings a smile to her face as Little Sister B adores not only hearing her name in the words, but seeing her own face right there in full color. How could she not smile seeing herself right there in the action? To make a good thing even better (or, in this case, a great thing even more fantastic), the message of this book is amazing as well. While other custom children's books that I've seen in the past have been nice, the actual plot of the book is pretty lackluster in comparison to the personalization. However, with Lookio Books, there was clearly a significant amount of time and attention spent making sure that the words themselves would be just as beautiful and educational as well. ...and, after going through all of her fun dreams, the story concludes with the message that, "There are so many things B can be when she grows up, but for now she's just happy being herself." I don't think that I could love the overall motto of the book any more than I do! Retailing for $29 (plus shipping and handling), the quality and uniqueness of Lookio Books really speak for themselves. 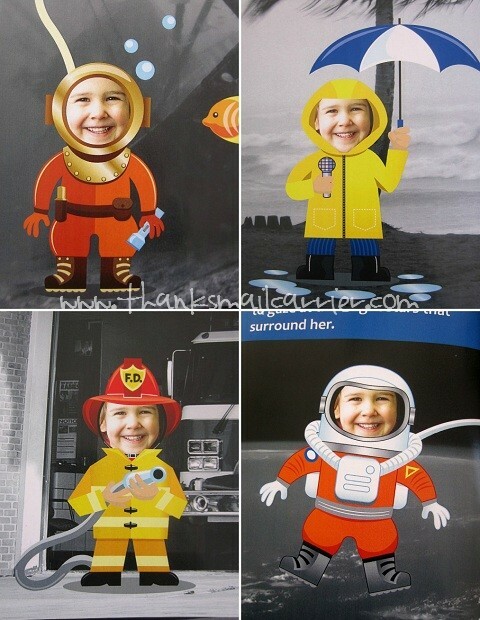 The full color art, the durable laminated cover and the positive, believe-in-yourself attitude that these provide are exactly what I love to find in products for my own children or as wonderful gifts. To take a closer look at all of Lookio Book's great options, visit their website at LookioBooks.com. You can also check out their blog to hear about kids' literature topics and the picture books that they love, while finding out what else they're up to on Facebook, Twitter and Pinterest. 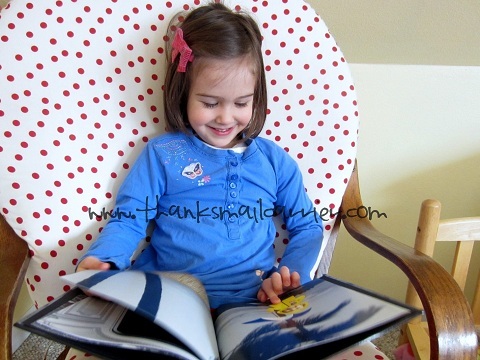 One lucky person will win their choice of Lookio Books personalized children's book! A big thank you to Lookio Books for providing a complimentary book for me to review as well as for one lucky giveaway winner. The opinions shared are my own and honest and if you really need to see more, click here to see how I roll. Currently my daughters favortie book is one called Parts. CJ loves his Robots book. Right now my Granddaughters favorite book is Counting Puppies. right now it is winnnie the pooh- we're reading a set of 10 books! My daughter's favorite book is "Little Fur Family" by Margaret Wise Brown. My youngest daughter loves the book "Lama Lama Mad at Mama"
My granddaughter loves the book Curious George. It is My Tea Party... it is a custom made book that uses her name in it. My daughter really likes a book called Book! My daughter always liked Horton Hears a Who. My daughter loves any Dr. Seuess books. My son likes the book, I Love You Forever. The Magic Hockey Stick and Pinkalicious. I love Goodnight Moon and Kiss Goodnight! A family fav is where the wild things are. Mine as a kid and my kids love that book too. Mr. Willoby's Christmas Tree, year round :). My sons favorite book is "All About Trains"
When I was young my favorite was 'A Fly Went By'. The Cat in the Hat is our favorite around here! My kids love anything by dr.seuss! My daughter loves "on the night you were born". Thanks for hosting! Reagan loves her big book of princesses. the Gruffalo is my lil guys favorite book! The Spiffiest Giant in Town & Charlie Cook's Favorite Book are two of our favorites. My son loves Penguin and Pinecone. My son likes Green Eggs and Ham. These are soooo cute!!! I would love to give one to my friend's son. I used to love reading when I was growing up. I had a book like this that was a story about me going to the circus. My daughters favorite books are the Fancy Nancy series! We love the "Giving Tree". My son loves a book called "Make Way for Ducklings"
Amelia Bedilia! All the way! We love the skippy jon jones books! I have a grandson who loves any book that is Thomas the train. My son favorites are "Trucks" and "Clifford Plays Peekaboo"